We have been receiving a growing number of various types of questions via our company Web site (which is soon to be changed over to Windows SharePoint Services 3). So, we have added an email link to the blog sidebar to simplify the question asking process for now. Please leave the default subject line so the email would not be filtered out by our spam filters. We have also added some clarification as far as the time involved in answering any questions that come our way. We are more than happy to answer any questions that are posed. However, because we are a full-time I.T. shop with client support needs, we do need to draw the line at what questions will be answered and whether we would charge a fee for them. Why? Because, if we spend more time answering questions via the blog for free ... then we would be spending less time we on our client's needs that pay us to do so. In the end our clients, you our readers, and us and our families would lose. Windows Vista - Now ... Just Exactly What is in What Edition Again?!? We have our Retail (Fully Packaged Product - FPP) boxed XP Pro and Vista Business on which we base our Open Value Software Assurance benefits. We are eligible for the Windows Vista Ultimate upgrade or Windows Vista Enterprise upgrade editions with our Software Assurance Benefits. Okay, now ... can someone tell us simply and clearly: What is the difference between Windows Vista Ultimate and Enterprise features in one page or less ... preferably via a grid? Microsoft's Windows Vista Choose an Edition site does not clarify that. Large, global organizations with complex IT infrastructures should consider Windows Vista Enterprise edition. Therein we find a link to Vista Enterprise's features. Still, we don't find a grid to compare to other Vista editions. Part 2: Understanding the Vista Product Editions. We are provided with a grid, and the answer to the question we were asking. The answer is: The primary difference between the two editions is the inclusion of Media Center features along with the Media Center Extensions and DVD making software in Vista Ultimate Edition. 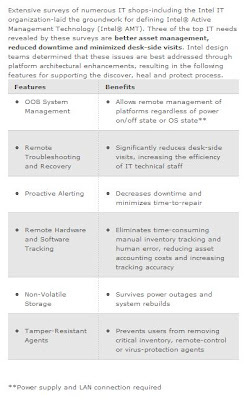 For us, the differences are important as we need to explain to our client's senior partners the edition options that can be installed on their systems. We may also be required to run some training for our client's partners on the Ultimate feature set either here or on-site. It has been consistent now, with each build that we have done for our classroom systems: DQ35JOE will not accept more than 4GB out of the box. One should install 2GB of RAM first and then flash the BIOS. Change BIOS settings as needed. Turn on the RAID controller if needed. CTRL+I to setup the RAID array - start the key strokes just before the RAID configuration page as it goes by quick! Please note that the BIOS file was just updated on October 24, 2007. So, it is relatively new. Update your bootable Flash Drive as appropriate. UPDATE: Please be patient with this BIOS update. It seems to take a long time! With the advent of optical drives utilizing a SATA interface for data, one needs to keep in mind where that drive will plug into the motherboard. This was true with the IDE optical drives as well. One would not plug the optical drive into the same cable as the hard drive as the data bus would configure itself according to the slowest device on the cable and system data throughput/performance would take a huge hit. While this may not be the case with SATA with regards to connected device speed, one still must consider the order of devices connected to the SATA controller. This is especially important if we are integrating a RAID setup via the on board RAID controller. 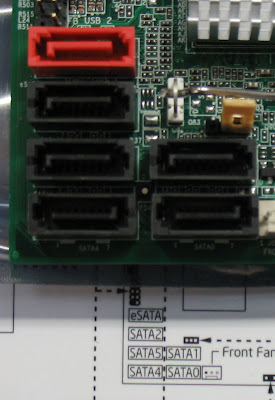 In the case of the DQ35JOE, one must also take careful note of the SATA connector order on the board itself. For whatever reason, the ports are not in an intuitive order. Note that the last port in the order, SATA5 (in bold), is situated in the middle of the cluster of connectors. The eSATA port would otherwise be labelled SATA3. So, which port would be the one to connect a SATA optical drive into? While there may be no actual convention in place, we would say the last SATA port in the connector set: SATA5. We would populate SATA0 and SATA1 for a RAID1/0 setup or SATA0/1 and SATA 2/4 for a RAID 1/0 or RAID 5 setup. Time and testing will reveal how the system will behave with the optical drive plugged into other ports, but while at the Intel Technical Solutions Training (TST) event last Friday, our Intel instructor, Eric, did indicate to us the people in other TST build sessions had troubles before they realized that they had the optical drive plugged into the "wrong" port or in the wrong order relative to the hard drive. When integrating desktops or servers - especially in the case of servers - one must investigate the various support materials for the products being integrated into the system. The first two links are especially important in JOE's case! Why? Because it will save a bunch of time troubleshooting those "beep codes" or BIOS messages or server board "Error Light Conditions" or spontaneous system reboots or seemingly no action at all ... etc ... etc ... etc. Remember, we cannot satisfy Intel's warranty validity requirements if the integration conditions laid out in the support materials are not followed. With the advent of the DQ35JOE board and no PS/2 ports, we are in need of a new KVM setup for our workbench. Up to this point, the D-Link DKVM-2KU has done the trick. We have 3 wall mounted LCD monitors that enable us to work on up to 6 systems at the same time on our bench in the shop area. So, what do you use and why? Eric Ligman is reminding all of us just what will be included in the new SBS Cougar: What is going to be in "Cougar?" We emphasize the 64-bit only line at the end for a reason: We are gearing up for a number of upcoming Swing Migrations for clients that are at the end of the line for their server hardware and this is the only method, in our opinion, that will work for moving clients from SBS 2003 to SBS Cougar. It may, or may not be, obvious, but, one cannot do an in place upgrade of a 32bit operating system to a 64bit operating system. It just ain't going to happen. 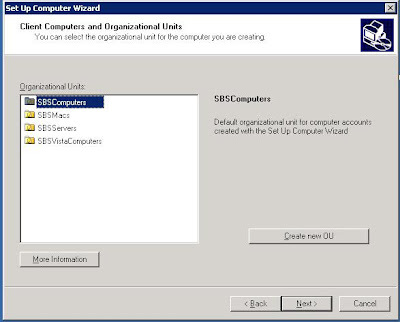 So far as we can tell, Jeff Middleton's Swing Migration method will possibly be the only way we will be able to migrate current SBS client domains to the new SBS Cougar setup. We are on the Cougar Beta Program, so we definitely have testing the Swing Method on our To Do list when the Cougar beta is more mature. When setting up Open Value Licensing with the client, they will know that they are entering into a 3 Year Agreement with Microsoft, the cost of the licensing would be distributed over three years, and that the first payment would be due immediately. The second and third payments would be due on the one year anniverary of the initial Agreement signing. Open Value Licensing is an excellent way to mitigate some of the costs associated with software purchases, includes Software Assurance over the three year period, and provides a bit of fixed income for our company for the duration of the Agreement. At this point, Software Assurance is important as SBS 2008 "Cougar" is just around the corner. 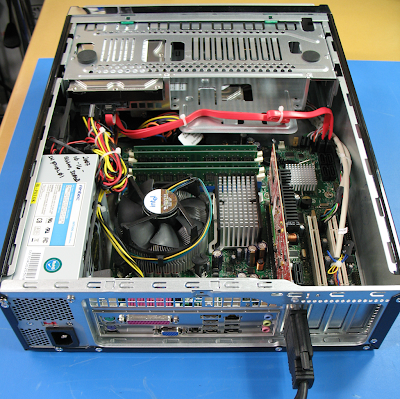 We just rebuilt an Acer 6460 that is about a year old. The laptop came with a Hitachi Travelstar HTS541616J9SA00 160GB 5400RPM SATA 2.5" drive. This is the second Hitachi drive failure in this laptop since the unit was purchased. We are experiencing a very high rate of failure on their laptop hard drives relative to the other manufacturer's drives we see installed in the laptops we sell. Toshiba hard drives run a somewhat close second. After running the system restore DVD, we ended up with a single FAT32 partition on the replacement drive with no recovery partition. 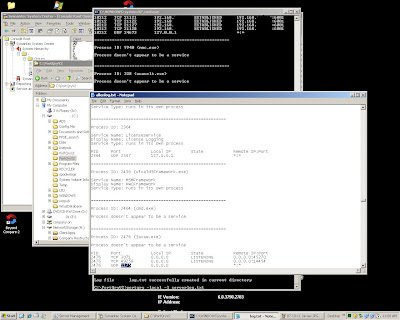 So, to save a little time we ran the Windows XP built in FAT32 to NTFS converter. The OS will not be able to run the conversion since we are converting the system partition. It will balk at dismounting the system partition. Answering yes to the request to run the conversion on the next reboot will solve it. In this case, the system started the utility on the reboot, then rebooted the system once to continue the conversion process. Once the conversion is complete, it is important to scan the drive with the Defragment Utility. There will be a bit of a messy organization on the drive after the conversion, so we will need to defragment the drive. Once that is done, we went on to run all of the available updates and setup the laptop for the user. Microsoft KB 307881: How to convert a FAT16 volume or a FAT32 volume to an NTFS file system in Windows XP. We have a virtual machine with Vista Business installed on it that is connected to our internal domain. It is being used for some particular network and application testing for our environment. Every once in a while, it is impossible for any restricted level user to log onto the machine. After a great deal of searching around, there doesn't seem to be any "fix" for the situation yet. The workaround is to reboot the system and hope for the best. In our case, it works, but in investigating this problem, there are people out there supporting classroom systems that are having this hiccup during classes on several hundred machines. I did some investigation with a debugger when the problem occurred again on my computer. It is quite different though - instead of loading each component as an in-process DLL, the new mechanism uses RPC to communicate with the registered components, and each of them runs as a separate service. 2. When a logon event occurs (this can be a logon, logoff, lock, unlock, etc.) Winlogon calls each of these 'components' (by binding to a predefined RPC endpoint, the endpoint name seems to be derived from the service SID of each service that is registered for the logon notifications). There seems to be a timeout if the registered service does not respond quick enough - about a couple of minutes. 3. If some service fails to respond to the logon event, it may cause the logon to fail. However, it seems that if the user is a local administrator, the logon does not fail (although it may be slow due to the timeouts). 4. It seems that the service which causes the most problems is the TrustedInstaller service. 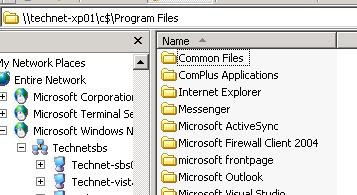 This service is used to install Windows components, including Windows updates (.MSU files). It is not used for the installation of 'normal' Windows Installer (.MSI) packages. What I found is that sometimes, after installation of an update the TrustedInstaller service stops responding to the Winlogon notifications, causing the problem. The Windows Defender service is not the cause of the problem. However, when Windows Defender in enabled, most updates installed by Windows Update are the Windows Defender definition updates. 5. The workaround is to kill the TrustedInstaller.exe service using Task Manager (it cannot be stopped otherwise). Of course, you should not do that while an update is being installed. The TrustedInstaller service will be automatically restarted when needed (for example, when you use Windows Update). This is a pretty good description of what is happening in the event logs. Event ID 1530: User Profile Service - Windows detected your registry file is still in use by other applications or services. The file will be unloaded now. The applications or services that hold your registry file may not function properly afterwards. 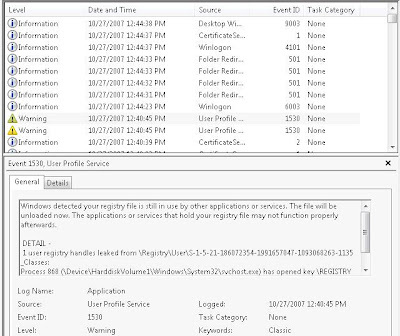 Event ID 6003: Winlogon - The winlogon notification subscriber [TrustedInstaller] was unavailable to handle a critical notification event. Both errors occurred around the time the restricted user was trying to log onto the Vista virtual machine. In this case, as indicated in the previous MSDN Forums (above MSDN link starting at the first page) posts, the process ID that was holding onto the registry was indeed Windows Defender. Microsoft Live Search: Vista Cannot Connect to the System Event Notification Service. Microsoft MSDN Forums: Limited User account cannot log on due to error: "could not connect to the system event notification service"
Hopefully we will be seeing at least a hotfix sometime soon! Notes from the Intel Channel Conference Lite in Red Deer, Alberta. To keep things simple and easy to search for there will be several posts covering different Intel product areas. The key thing to note is the "R" at the end of the product part number. The "R" indicates that the product will be Xeon Penryn 45nm processor capable. This revision shift is important to note when considering a server quote for a client. If the client will be using the server box for two our three years ... or even more, then there will not be too many worries about the processor limitation built into the current S5000PSL series boards. If, however, the client may need the option to more power and Penryn at a later date, then the "R" code becomes a factor. Timing is also crucial. While we are seeing the new "R" code products SKUd up at the supplier level, this does not mean that the new products will be in the pipe any time soon. Keep this in mind when putting together the preliminaries on a presentation with a client or prospective client or an actual quote for product delivery. The "R" code products are due to be released on November 11 of this year. As with other Intel motherboard and server board product releases, keep an eye on board revision level and processor compatibility charts to verify that the processor one thinks should go with a particular board does. 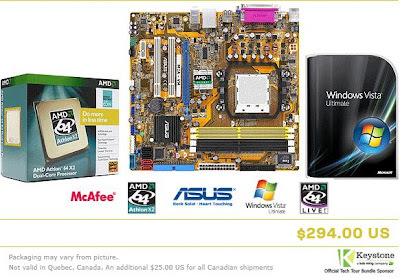 Every Intel motherboard product page has a link for processor compatibility. And one more thing, check the Tested Memory List (S5000PSL list for example) and only supply and install memory on that list. Why? Because, if there is a system stability problem and one is on the phone with Intel troubleshooting it, one of the first things they will ask for is the memory part number. And, if the memory is not on it, they will recommend replacing whatever is in the server with the proper memory. We know, we found out the hard way. 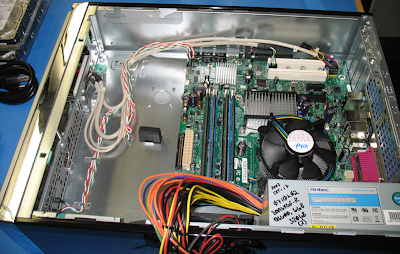 Server boards are particularly finicky when it comes to memory and peripheral components plugged into them. That is why we stick with Intel server products. We have a full range of compatibility lists that help us to determine exactly what server related products and chassis will work with the server setup we are planning for a client. We are not left out in the cold hunting and pecking for the right combination. That is time consuming and can get very expensive very fast. Intel Blog: Technology@Intel - Penryn - More Penryn info. There is a real easy way to get Symantec/Norton software off of a system. Because Symantec's Web pages are active, the links change all of the time. So, here is a Live Search for said tool: Norton Removal Tool. We make very good use of the tool. Also, the tool has a built in expiry. Thus, one needs to check the Symantec site on a regular basis for a renewed version of the tool. A while back, we were quite excited about heading down to Calgary to attend the AMD Microsoft Retail Tour (previous blog post). At that time, the pictured Windows Vista Ultimate in FPP (Fully Packaged Product - Retail) seemingly made the bonus bundle a very attractive option for us. The tour itself was okay, with a lot of the information from Microsoft being a rehash of information on the 2007 version products being released or soon to be released. The information from AMD was along the lines of what we were expecting as well. With the new Intel Core 2 line of processors wresting the performance crown away from AMD for the first time in 5 years, the information was a little on the iffy side as far as processor comparison charts and the like. So, a question to you: Given your experience attending Microsoft and possibly Intel conferences and seminars of various sorts, what product license version of Vista Ultimate would you be expecting when the bonus bundled arrived? If you have attended any type of vendor/manufacturer/supplier conference, you would probably answer FPP - Retail. Why? Because, in all of our experience, that is the only product licensing type we have ever seen being given away. So, imagine our surprise when the bundle arrived and we had received an OEM version of Windows Vista Ultimate NFR. Why does OEM NFR not work for an I.T. shop? Because, a desktop system does not last long in our organization. Once it goes out the door, it is gone. 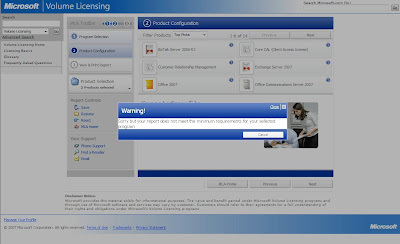 OEM licenses are not transferable to the new system owners. Our clients that purchase those systems are also purchasing a new OEM license with it. And, they activate the OS based on the new OEM license they purchased. That is why we purchase FPP - Retail product and Open Value SA to augment our MAPS licensing for our internal desktop OSs. OEM does not make sense for us. Our response was to send a note to the marketing company that sponsored the bundle: Keystone. This offer is only available to either (A) a system builder or reseller of Microsoft software, or (B) an employee of a Microsoft retail partner. Complete eligibility details available at time of purchase. As you will note, it does indicate that the packaging may vary from the picture. I thank you, in advance, for your understanding of this matter. Unfortunately, there is no polite way to respond to the second line in the response. [We] have a beef with regards to the AMD/Microsoft TechTour bonus bundle. The images show Vista FPP and the description offers NFR for Vista. The general assumption, given previous Microsoft conference experience - they always give out FPP - is that we would receive a Fully Packaged retail NFR version. Instead, we received an OEM/OEI Vista Ultimate copy. The caveat listed below the picture of the products, "Packaging may vary from picture", in my opinion does not cover the difference between OEM and FPP product. It covers whatever the product COMES in. Given the fact that this is our first venture back into AMD product territory in over five years - we were burned very badly by a string of bad AMD based product - it is not boding well for AMD. An OEM - NFR tag on the coupon for the Vista Ultimate product would have been the best way to describe it, and also would have resulted in a No-Sale as the deal would no longer appear to be one. The OEM - NFR tag would have made things a lot more straight forward, as the message would have been, "This is the exact product you are getting" as opposed to, "This is the product you may be getting - or not getting". I personally do NOT like this kind of advertising. As a business owner, our company being Microsoft Small Business Specialists, we take great care to make sure that our clients know exactly what they are getting. There are no caveats in our descriptions. Please advise me as to how you want to proceed. AMD responded that the presenter would have mentioned that the Vista Ultimate would be an OEM copy. Both my colleague and I did not hear that as we were avidly listening during the portion of the presentation that focused on the bundle. What could we do? We followed up with the AMD representative and let them know that all was forgiven. In response, they in turned promised to rectify the situation after coming back from a vacation break. They only asked that we send them a reminder to do so after they were back. We sent three reminders over three weeks and nothing happened. It is unfortunate that the AMD did not follow through on their commitment to make things right. We all know the cliché: "The customer is always right". And, as small I.T. shop owners, this is even more true. There are times where we need to bite the bullet and make things right with our client ... even if it costs us. Go figure, we have been trying to download the .ISO of Windows Server 2003 Web Edition today via the Open/Volume Licensing portal and we can't. We can't call into the Licensing Support Centre since their phone system seems to be down too. So, we wait until tomorrow. We haven't had time to work on getting the iMac back online with the SBS network lately so this post comes via one of our PCs. However, there are only a few more days to OS X Leopard according to Apple's OS X Leopard site. Our Canadian suppliers have Leopard SKUd up and show stock coming in with no ETA. Ever hunt for something and not find it because it is not where it is "supposed: to be? In this case, we are setting up a couple of Windows XP Pro Virtual Machines with Office 2003 Pro installed for some testing sessions that we will be doing. The VMs are already resident on a Virtual SBS domain. These particular XP VMs do not have Office deployed by GP or installed before being added to the domain. If they did, Office would be in its standard install location under C:\Program Files\Microsoft Office. Having Outlook already installed by the SBS domain setup routine means the full version of Office installer picks the current location of Office Outlook: C:\Program Files\Microsoft Outlook. So, on a day where we may have had five or six workstation installs where Office was not delivered via GP, we may miss changing the install location to \Microsoft Office on some of the machines that are already on the SBS domain. In our experience, there is are caveats with changing default install location for applications such as issues with registry settings, subsequent uninstall needs, and other hiccups with product install or reinstall situations. This is not so common anymore, but still happens occasionally. Our system builder has been testing the new DQ35JOE for over a month now. They told me that they are quite happy with the results of the tests. So, we will be building our corporate systems on the new Intel Desktop Board DQ35JOE from now on. In the mean time, we are going to build a series of Core 2 Quad Q6600s on the JOE we will obtain through distribution. The systems, around 5 or 6 to start, will be used in a training lab we are putting together in the shop here. It is pretty obvious that this is not just a step up in a board revision with a relabel. We are seeing 32bit 33MHz PCI go the way of the Dodo. Kinda reminds me of the PCI replacing ISA days. For that matter, PCI 32/33 has been around for a long time in computer years. And, check out the very left hand bottom of JOE: There is no PS/2 connectors! :D YAY! Anyone else remember the promise made somewhere around 10 years ago? Wow! It sure took one heck of a long time for that one to pass. Same with the now absent parallel and floppy ports! The new JOE has dual video out. One DVI and one VGA that will now support dual monitors native to the on board video. That is a pretty kewl feature. In some cases where high powered video is not required, this will save a few bucks for our clients that do things like desktop publishing and the like. JOE comes with an eSATA connector - in red - that has an external mounting bracket with cable that can be mounted at the rear of the case. While eSATA is definitely a neat feature, it presents a bit of a predicament. That predicament is data protection. This is one place where a smaller client with no Software Assurance/Enterprise Agreements really should consider BitLocker. BitLocker should be an easy sell to any client requiring client data security. Think doctors, lawyers, accountants, dentists, and any other professional or trade where client/customer data needs to be protected. Tie BitLocker into that external USB HDD that is mirroring the internal hard drive, some training on the use and rotation of the drives, and a second drive (we use different colour enclosures) for off-site rotations, and we have have a nice little security package we can propose to our clients. And remember, the product life cycle may be at least two years, but that does not mean that we will not run into some sort of revision level to CPU compatibility next year! We did a consult with a non-profit company that is purchasing Microsoft Charity licenses via a local vendor a while back. 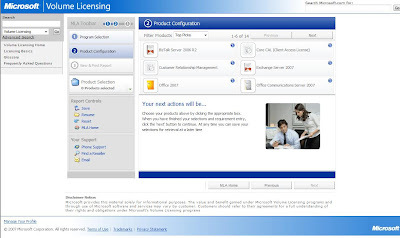 In the case of server and Office software, all Charity and Open licenses are full version products. The exception is in the case of the Windows Desktop Operating System. What this means is, the organization must either have a Fully Packaged Product (FPP) (Retail) with all of the contents intact of a qualifying version of Windows, or an OEM version that qualifies as a version that can be upgraded by the Licensed upgrade edition Windows OS. Despite the fact that the OLP Windows XP Pro did not have the appropriate Upgrade Check Bits in place, it was an upgrade version. So, in the case of an organization that is running their entire desktop OS environment on their Microsoft Charity Licenses for Windows XP, there needs to be the qualifying OS base to work from. If there are no OEM COAs, CDs, and manuals or FPP on site for machines that are already in place, they will need to purchase Fully Packaged Product (Retail) to set their licensing straight. A Licensing version of a Windows Desktop OS always has to have a legitimate full or OEM OS to upgrade from. PERIOD. Even with the "Vista Workaround". There has to be a qualifying FPP or OEM license associated with every machine in the organization. Remember, we are responsible for advising our clients on licensing, so we need to be absolutely clear where we stand when it comes to properly licensing any software product installed on the network infrastructure we are managing. In our case, when working with a new client that is not in compliance, we would work with them to bring them into compliance. If they resist or refuse, we have the appropriate legal letters and registered mail to take care of severing the business relationship if required. If it was required, we would then walk away. We would also follow the recommendations of our legal advisers from there. It is a point of principle. Keep in mind that if a client, or even former client, gets audited and they are not in compliance, then we can bet that the BSA would be knocking on our doors next, and then any other clients that were then indicated as not compliant via our records would see a visit too. Can't seem to upload images. It has been that way since this morning. Hopefully they get it fixed. 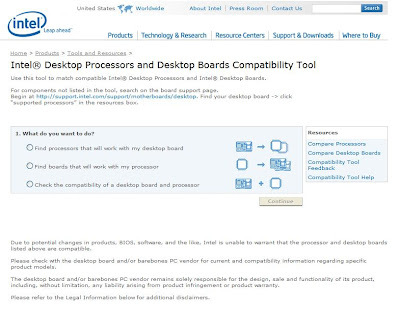 The Intel DQ965GF Desktop Board has a recent BIOS update released on October 11, 2007. Build Number: 1518 PC 14.27 07/06/2007 17:11:20. Time to update that bootable Technician's Thumb Drive (previous blog post). We always update the BIOS on the first boot of a system or server we put together. Normally, we don't have too much time around here to spend looking through some key sites on the future of the bleeding edge. Hopefully we will see this setup with a CrossFire capability too. There is definitely a market for this kind of rig outside of gamers. Think 3D rendering, and evening/overnight render farms for things like 3D Studio Max and the like. Think Revit 2008 or AutoCAD 2008 with Ramsteel and other intense calculation add-ons. Or, 3D and huge calculation setups like SolidWorks. These types of applications will benefit from this kind of rig. This is where we smaller shops can take a huge advantage over our larger competitors. We can arrange to walk into one of our engineering or architectural firm clients with one of these rigs under our arms with the required software already installed and ready to go. Then, we could allow some of their more advanced CAD/3D operators have at it. This would make a huge impression on the users and their managers after a couple of days of use. Imagine how the client's user would feel when they went back to their previous system! Doing the same with the Core 2 Duo, Core 2 Quad, and Core 2 Duo/Quad Extreme rigs worked in this manner. The products essentially sell themselves. The Return On Investment may need to be explained a bit to the management, but that should not be too hard for someone who knows how more horsepower impacts a CAD/3D operator's efficiency and the overall organization's productivity. The particular CAD/3D operator grows into the horsepower of the system increasing their productivity fairly quickly. And, the overnight rendering farm increases its productivity per watt consumed as a result of the increased horsepower available in the Extreme based boxes. The last one is especially important to the bean counters: Systems that consume less power to do more reduces the power bill for both the system itself and the air conditioning needed to keep the working areas cool. Looks like Skulltrail will give the Mac Pro Dual Xeon X5365 Quad Core $10-12K system a run for its money! The Mac Pro in this image is missing some additional hardware like more ATI video cards! TG Daily article came via Slashdot: Intel in the GHz Game Again - Skulltrail hits 5 Ghz. All Mac on SBS posts are posted on our in-house iMac via the Safari Web browser. Distribution is showing SKUs and in some cases, we can actually purchase them. This situation is identical with the release of the 3000 series Dual Core Xeons last summer. We had processors, but no S3000AH series boards to plug them into. So today, on the phone with Intel we go. The representative we spoke with indicated that we should be seeing an X38 series replacement for the S3000AH SKU up soon. Actual product flow will probably mirror our experience with the S3000AH too: Disti was reluctant to carry them and the processors while Pentium D processors and the SE7230NH1 were still prevalent in their own supply pipe at that time. 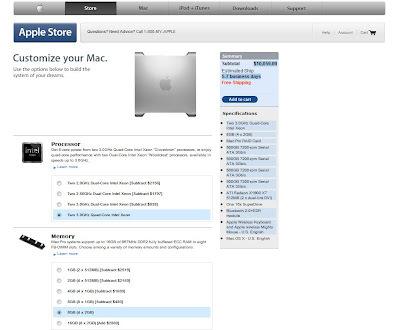 So, the same may be true while the S3000AH and the current 3000 series Dual Core Xeons are available. This time around though, it is not a big deal. An extra boost on the Front Side Bus will not break us. But, things were not the same during last year's CPU/Motherboard tech shift. Like our experience transitioning the desktop to Core 2 Duo from Pentium D, server performance jumped leaps and bounds ahead when we got our hands on our first Xeon 3050 and an S3000AH server board and could compare that server box pound for pound with a Pentium D server we had just finished building. The Xeon 3050 put the Pentium D 950 to shame hands down. Usually when the RSS feeds being aggregated in Outlook no longer feed in, a reboot fixes it. Well, several reboots later, nothing seems to be working. Outlook keeps throwing 0xD07C0008, 0xD28C0008, 0xD49C0008, 0xD6AC0008, and so on, and so on, ad infinitum. 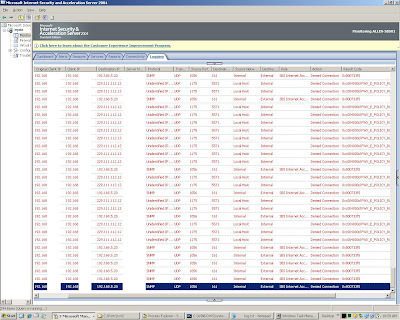 This is Outlook 2007 on Vista x64 connected to our SBS Exchange server. So, the next step is to export all of the feeds, then import them again. Nope. Doesn't work. So, what are the options from there? One is to delete them one by one. Then, import the OPML file again. What a tedious process. There is a very painful pause in between each one. This is oh so senseless. So, after all of this, Outlook is pretty much unresponsive. This is after deleting two of the blog feeds. There is not enough time in the day to fix it. So, time to throw in the towel. 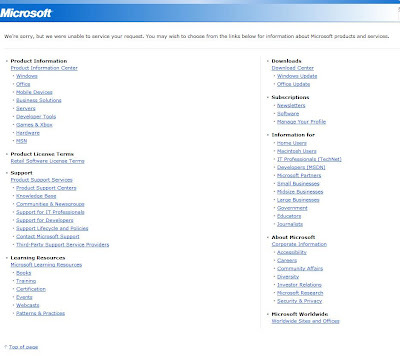 Are there any good RSS Readers that integrate into Outlook 2007? Or, perhaps a standalone reader. Free is not so important as the ability to sort the feeds by blog and perhaps a further sort by subject would be nice. Okay, maybe I spoke too soon. Outlook seems to have recovered. I was able to delete the feeds in both IE and Outlook, and the feeds are coming back with no errors - or at least some of them are. Time will tell if they pick up or not. This breakage is cyclic. There seems to be no rhyme or reason behind it. But, it just keeps happening! The question above still stands though. Time to move on until Microsoft gets their collective Outlook stuff together and fixes the problem. Previous post on the subject: Outlook 2007 - RSS Broken Feed Frustration. Almost all of our clients have an Acceptable Use Policy (AUP). The AUP outlines what one can and cannot do with company equipment and Internet access while in the office or out. One of the requests we get is to place a restriction on which Internet sites that users would commonly visit during working hours or at all. Some sites at the bottom of this post. Click on + beside URL Sets and double click on "Workhours Deny"
Click the Action Tab: Tick "Redirect HTTP requests to this Web page:"
Name ClientName Workhours and set the active times. We set 0800 to 1800 for the times as a rule for all 7 days. Click Apply and OK in the ISA Console. Any site that would essentially waste a user's time or open the network to possible compromise would normally make the list. In almost all cases, most people figure it out and there is not a problem. Once in a while a little more is needed, so with the Client Contact's approval, a simple email with a screen shot of an ISA report showing the user name and sites being visited is sent to the problematic user. This usually kills the behaviour immediately. We were migrating an existing peer to peer network to a SBS Premium based domain. This error had absolutely no indication as to the cause. By this time, it was getting quite late, and the answer just did not seem to be forthcoming in our Web searches. So, we took a break from it. 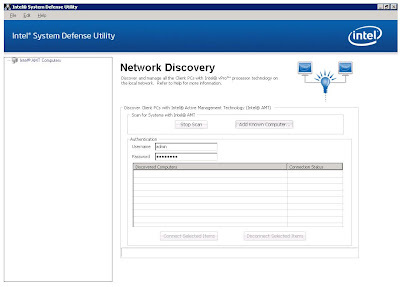 The following day, we were able to finally discover what was causing the problem: We had setup the ODBC Datasources using the mapped network drive for the setting in the ODBC Administrator. A huge thank you to NextLevel Information Solutions for sharing their fix for the problem. It is a little over half way down in the FAQ. The reason that brought us to the aformentioned Mr. Client's location was a complaint that some machines were no longer able to connect to the network. The possibility of a switch failure drew us to bring an extra Gigabit switch with us as we have seen switch failures before. It turned out that we needed to create a special rule in ISA for client machines that have lost their IP completely and now had a 169. address. Note that the Listener is set for only the Internal and Local Host interfaces. We don't want the DHCP rule to access the Internet NIC. 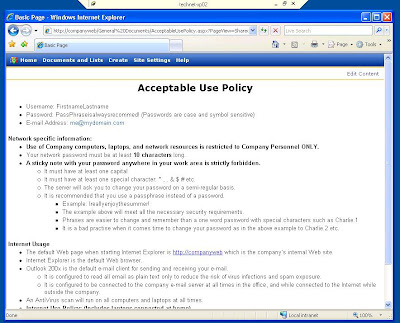 Your now complete rule will look like the above pictured ISA Firewall Policy that is highlighted. Doing a release and renew will allow the client computer to now connect. The reasoning as we understand it can be found in a previous post: SBS 2K3 Premium - All Editions, ISA, and DHCP on SBS. This particular SBS Premium box was installed last year during a run of large installs and apparently we missed this step during setup and the DHCP issue didn't rear its head until now! But only for that particular IP range. We are finishing up the setup of two new Acer laptops, and seemingly IE 7 is not available via Microsoft Update. At least, it did not show up when searching for updates on the machines via the Microsoft Update Web Site. It can be downloaded from here: Windows Internet Explorer 7 for Windows XP SP2. If it doesn't appear on M/W Update again, then it looks like this is one for the Technician's Thumb Drive for sure! It would be good to store it on the workbench network too. UPDATE 2007-10-23: The IE7 for XP update has shown up again on Microsoft/Windows Update. It still requires us to run through the setup steps as before but without the validation component. Thanks to Andy (comments section) for the initial heads up.